Home > Health & Wellness > How Much Protein Should You Be Eating? If you are an active adult looking to build muscle then you need to be eating around 1.2 -1.6 grams per kg of bodyweight so if you weigh 60 kgs for example you should be eating around 80-90 grams of protein . If you are eating 3 times a day a good rule of thumb is around 30g per meal. Or alternatively this could look like 30 grams at lunch and dinner and 30g as some kind of EAA either before or after your workout. If you are overweight and looking to lose weight keeping protein intakes higher is going to help you (usually ). Filling you up and keeping you satiated and ensuring that you are losing fat rather than muscle mass. Although your overall calories are important – eating too much protein will also prevent you from losing weight. Inactive people can eat less protein than this and in fact inactive people may benefit from just eating 2 meals per day in an eating window. Dividing your protein up through out the day ensures you preserve your lean muscle mass and also makes for optimum absorption. 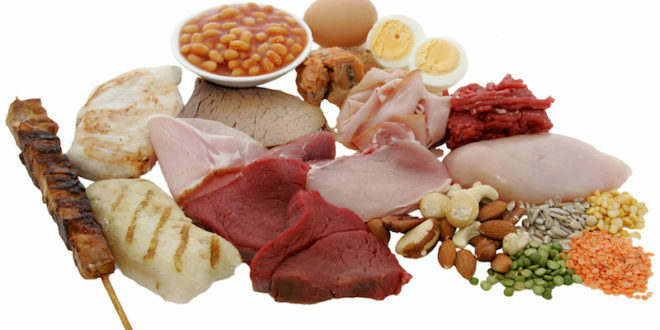 Too much protein will simply lead to waste or fat storage . This particular study, reported in the Journal of Nutrition found a 25 percent increase in muscle protein synthesis when protein is divided into three, 30-gram doses ( breakfast, lunch and dinner ) compared to eating the same total protein (90 grams) but in this distribution pattern: 11 grams protein at breakfast, 16 grams at lunch and 63 grams at dinner. Forget the window – there is no need to eat immediately post workout unless as just stated you intend to workout again that day- in fact new research states that waiting a few hours to eat enhances the break down and clearance of bad cells in the body otherwise known as autophagy. For strength athletes, several studies show that the body’s muscle-building capabilities are enhanced for at least 24 hours after hard resistance training, so as long as you train hard and get enough quality protein in your diet, you don’t need to worry about drinking your recovery beverage as soon as you’ve completed your last rep. Some studies show muscle protein synthesis doesn’t even turn on for about 30 to 40 minutes after exercise, so as long as you eat 30 grams of high-quality protein within a few hours post-exercise, you will optimise muscle building. Pricey Protein Supplements are not necessarily better than real food- unless you have no choice. In the real world with food at your finger tips go for the complete protein. Unless you are a vegetarian or vegan, you should be able to obtain all the essential amino acids necessary to optimise muscle protein synthesis by eating real foods. The key is getting enough of the nine essential amino acids, with particular attention to leucine, the branch chain amino acid that directly stimulates muscle protein synthesis. Leucine is found in ample amounts in dairy foods, poultry, fish, beef, beans and eggs. If you eat 30 grams of protein from a variety of high-quality protein foods you should get about 2 to 3 grams of the amino acid, which has been shown to optimally stimulate muscle protein synthesis. Vegetarians and vegans may need supplemental protein to get enough leucine in their diets. In short protein levels vary from person to person depending on age, level of activity and your specific goals. Mainly your gene expression – using my DNA technology we can work out the specific nutritional plan for you to optimise your weight and athletic performance.